Do you understand what "Transition overground" means? Thank you if you answer. The sign has the English words "Transition overground" and a pictograph of a man climbing stairs. What would this sign mean to you if you found yourself near a foreign railway? It means my train to Vladivostok is leaving from platform 2 in 10 seconds. I would further assume that there is another sign showing a pictograph of the considerable carnage involved in crossing the tracks by jumping onto the lines with a big red circle and a line struck through the heart. But I'd still take the short cut. Your name reminds me of a question. Can anyone tell me who invented the steam engine? I also think it means, "Go up the stairs to get to the crossover which takes you to the other side of the track", but I would have to think about it a minute. Maybe, "Upstairs to Track Crossover"? Thanks for that Seekers gem. One of the more underrated groups of their era. We call that a Pedestrian Overpass in Canada. 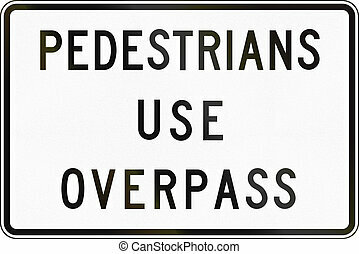 Seems to me that "Pedestrians Use Overpass" would be for the people walking on the sidewalk who want to cross over the train tracks. I think Alexander is talking about a sign telling people who are standing on an underground train platform how to cross over to the platform for the train going the other way. Canadians seem to understand the meaning. Not complaining about the signage, just wondering if they post that sign on underground train platforms, as well as on the sidewalks above ground. It's not the way we would say it in English and would confuse people. A transition is not a movement of a person's body, like walking. It's more of a social movement, such as Communism to Capitalism. "Overground" also sounds strange. Both words are literally true, but it's like saying "I elected a new hairstyle." Thank you for your answers. I think that the sign "Transition overground" is used at normal railway stations, not necessarily underground. As far as I understand, the sign is for people who are going to use a train very soon or have just got out of a train but the other people who stroll near or through the station can take the sign into account. It means..I think ...that there is a "pedestrian walking bridge" that is not underground....I think it is called "pirijot" in Russian language. oh actually i like the last answer, as in as opposed to underground. that makes much sense. » Do you understand what "Transition overground" means?